Mr. and Mrs. Jones were floating in a small vessel in stellar synchronous orbit around Sirius. They stared out of the windshield at the flares coughed up the nuclear mass. Mr. Jones handed Mrs. Jones and smoldering joint and she handed him a near empty bottle. They nodded in unison to the thumping of the music bouncing around the pod. “That one looked like a cow,” Mr. Jones said pointing out the window. “Mom? Dad? We got a…,” a voice said over the music before being switched off by Mr. Jones. Mr. and Mrs. Jones continued to nod. “Should probably see what that’s about,” Mrs. Jones said relighting the joint with a small laser. “What?” Mr. Jones sighed letting his head drop against a console. “Alive was a better price,” replied Mrs. Jones. “Any ideas on where he’d be heading, Holly?” asked Mrs. Jones. Mr. Jones looked at Mrs. Jones, shrugged and turned his palms up. “Wolfy, we’ve found smaller needles in bigger haystacks,” said Mrs. Jones pulling on an owl mask and fastening it. Leo rubbed his bloodshot eyes and strapped on a mask resembling that of a plague doctor and a black wide brimmed hat. “I’ll keep you guys updated when I am,” Holly’s voice said. After a few quick switch flips, Wolf yanked the flight stick and their vessel peeled away from the white star. “Computer. BoC, please,” said Wolf. Several gruff aliens sat around a long table and shouted, buzzed and gurgled at each other. A hair covered humanoid, encased head to toe in glinting armor stood up and slammed his hands on the table. “I’ve heard enough,” he bellowed. The gaggle of sounds ceased. “Yaldabaoth expects us to carry out his plan even in his absence,” admonished the creature. “The man’s a buffoon,” shouted a tentacled mass through a small device. “The Zeta Reticulans remain loyal,” a hairless, grey humanoid piped. “I can only imagine what Yaldabaoth would do if were here and heard such disloyalty,” said the hairy, armored humanoid. The room was silent with thick air. The aliens around the table exchanged glances. Yaldabaoth flicked his index fingers at the dissenting blue mollusk and yak. “But at least I know where you both stand.” Yalda said. The hairy humanoid stood and moved aside. Yalda sat in his chair. “Vijeda,” Yalda said to the humanoid. “Yes, my Demiurge,” replied Vijeda. Yalda looked around the table with a dopey grin. A few scattered chuckles emerged from the gathering. Yalda frowned and shook his head at them. Yalda led the table in an open mouthed guffaw. “But he does,” Yalda said pointing to the yak man. Vijeda walked behind the squirming yak. The two aliens on either side held him down. Vijeda placed his hands on either side of the yak’s head and pressed. The cried and fell silent. Its eyes bulged and tongue lolled. It fell forward. Its elongated head hit the table split open. Yalda turned to the mollusk and leaned in. Yalda grinned and rang a bell. A man dressed in white entered the room and leaned over to Yalda. “What can I be getting sir for his supper?” the man asked. Yalda sat looking at the mollusk. “Very well, sir,” said the man. Yalda raised his eyebrows, nodded and grinned at the blue mollusk. Half the aliens lowered their eyes. The man in white returned with a serving cart. He placed two plates of escargot in front of Yalda. “Thank you, Wren,” Yalda said to the man. Yalda slid one of the plates to the mollusk and smiled. The mollusk’s flesh began to ripple. “My son,” the mollusk shuddered, trusting himself from the table and tipping his chair. “I go out of my way to have my chef prepare a meal especially for you and this is how I’m treated?” Yalda stood, his wings twitching. Yalda took the shaker of salt, unscrewed the top and threw it on the mollusk. The creature began screaming flailing as his skin puckered. He fell to the ground in a foaming mess. “Then dude leaves a mess,” Yalda sighed and flopped back in his chair. Yalda looked around the table at staring aliens. Wolfram made frustrated motions at the buttons and switches on his side of the flight console. “Where the hell am I supposed to be going?” Wolf groused. “Yeah, mom?” Holly replied over the comm system. “Any word on Yalda’s movement?” she asked. “There’s probably some places we can check in the meantime,” Wolf said. “Aren’t we in Forzen Kahl’s neighborhood?” asked Luna. “Worth a shot.” said Luna. “Both those things have Yaldy’s stink on it,” Luna said. “Forzen it is,” declared Wolf. The Jones’ ship rotated a quarter circle and raced off. After a time, the vessel approached a deep green planet. The ship slid into the upper atmosphere and began to descend. The clouds whipped and eventually parted revealing a lush, green, forest coated landscape that rolled away in all directions, periodically etched with blood red rivers. The ship found a clearing large enough descend. Once on the ground, a panel side panel slid open and Luna and Wolfram stepped onto the surface. The air was so humid, the Jones’ leather suits began to collect droplets of water. Wolfram and Luna produced energy blades from the cuffs of their long coats, one attached to each wrist and began slicing their way through the dense foliage. A mammalian creature with the mouth of a lamprey came screeching out the endless green and leapt at Wolf. Wolf stepped to the side as Luna perforated the side of the beast. The beast wailed and waddled off to disappear into the verdant mesh leaving a crimson trail behind it. “Don’t want to know what that was,” Wolfram said. “I meant I didn’t care,” Wolf replied. “Daddy didn't mean it, Holly,” said Luna. An audible raspberry came through communication system. Luna chuckled. They continued through the forest until they came to a rock outcropping. Wolf leaned into the formation and turned his head so one of the red eye lenses in his plague doctor mask was facing. The red lens began to whirr. Luna and Wolf retracted their energy blades and drew rifles from under their coats. As they entered the ground dropped away into deep chasm accessible via a makeshift staircase. The shaft down was dotted with intermittent pools of light. The steps creaked as they descended, occasionally dropping bits of rock and dust from its loose moorings. Once at the bottom of the shaft, they saw that it opened into a tunnel that stretched in either direction. “Take the tunnel North,” Holly said over the comms, “That’s where the life reading are coming from. Wolf and Luna passed through the tunnel under alternating fields of light and dark. A low whine could be heard echoing further down. The whine was joined by another from behind and another until a chilling choir filled the tunnel from both sides. Several betix passed under the flood light in front of the Joneses. Luna turned around and saw the same scene. They raised their rifles. For each betix a Draconian soldier emerged into the light with their rifles trained on the Joneses. “What do you mean?” asked Holly. “There’s about twelve of those skeksis or whatever you called them,” Wolf replied. “They’re wearing infrared cloaking collars,” Luna said. The soldiers barked in Draconian for the Joneses to drop their rifles and raise their hands. The Joneses complied. Two Draconians stood behind the Joneses and jabbed them in the back with their rifle butts, ordering them to start walking. Once down the hall, the Joneses were shoved into a dingy, but well lit room. There was a serpentine alien with multi colored plumes of feathers starting at his head and following along his spine, down to his tail, standing in front of a row of crates. 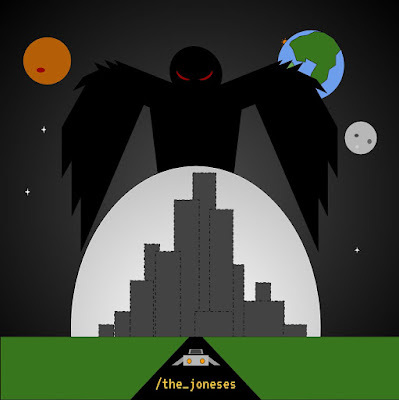 It was flanked by two seraphim who looked at each other askance when they saw the Joneses. The serpent slid forward. “Wouldn’t want the G. A. finding out their two most decorated agents are doing business with a known black market arms dealer, would we?” grumbled Wolf.